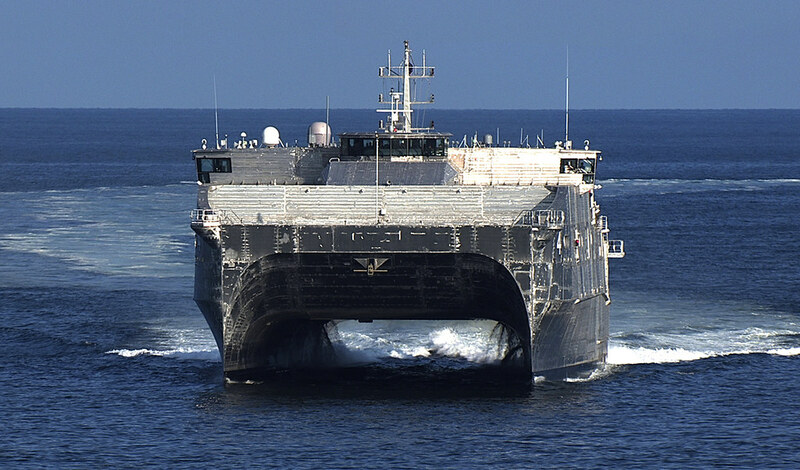 SINGAPORE - Staff from Navy Supply Systems Command, Fleet Logistics Center (NAVSUP FLC) Site Singapore are conducting load-out and logistical support for Military Sealift Command expeditionary fast transport USNS Fall River (T-EPF 4) in Singapore. The load-out and support are initiating the final preparation phase for the 12th annual Pacific Partnership mission which will run March-June. Fall River is the mission platform for Pacific Partnership 17, a multilateral mission which helps nations improve disaster response preparedness and capacity while enhancing partnerships throughout the Indo-Asia-Pacific region. "We are handling all of the critical logistical support for Pacific Partnership, including husbanding services associated with the departure of Fall River from Singapore and the various port visits for each of the missions, lodging for the participating personnel, transportation, phones for communication purposes, engineering and medical supplies," said Carolyn McCloskey, FLC Site Singapore supervisory contracting officer, Husbanding Branch. FLC Site Singapore manages the Navy's supply system throughout south and southeast Asia, providing logistical support to surface ships, submarines, aircraft, and expeditionary forces operating in the region. The Singapore team will manage all contracting actions associated with Pacific Partnership. The logistical support provided by FLC Site Singapore throughout Pacific Partnership will enable the mission staff and team from Coastal Riverine Group 1, Task Force 73, and Military Sealift Command Far East to focus on completing the day-to-day operations, enhancing the overall effectiveness of the mission. "Historically, logistical support determines the success of any mission," said Lt. Broward Maryan, deployed contracting officer for Pacific Partnership missions. "By providing complete and thorough logistical support throughout the mission, we enable our partners from CTF 73 and MSCFE to put all their energy into ensuring Pacific Partnership 17 is successfully carried out." NAVSUP FLC Yokosuka, one of eight fleet logistics centers under NAVSUP Global Logistics Support (GLS), is the western Pacific region's largest U.S. Navy logistics command. The enterprise networks more than 20 sites and fuel terminals from Misawa, Japan, to Sydney, Australia; Diego Garcia in the Indian Ocean to Guam, with a mission to serve the Indo-Asia-Pacific region's forward-deployed maritime forces with 24/7 operational logistics support integrating an extensive service provider network to deliver fuel, material, mail and supply chain services across the U.S. Navy's largest geographical AOR.